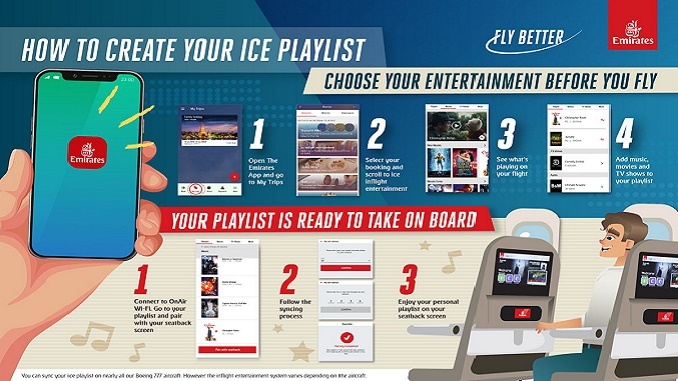 Emirates has introduced an innovative new function on its app to allow passengers to create bespoke playlists ahead of their flight and sync it to their seats once on board. The syncing capability means that passengers can use the Emirates app to browse and select what they want to see and hear from Emirates ice entertainment system before they fly. The playlist they create will then be available for them when they reach their seat. “In keeping with our ‘Fly Better’ promise, our teams work tirelessly to provide ever better world-class travel experiences. Every detail is carefully considered as we continually enhance and develop innovative products and services for our customers. Emirates offers entertainment in 44 languages and each month over 100 movies are added to the system. Emirates ensures its youngest passengers are catered for with a large selection of children’s movies and TV channels. In addition to over 75 Disney, Marvel, and children’s movies there are also over 50 TV channels, including Cartoon Network, Nickelodeon, CBeebies & the Disney Channel. ice also features varied content such as Emirates’ own Food and Wine Channels giving passengers a behind-the-scenes look at how it creates its onboard menus; expert-led LinkedIn Learning courses; as well as uTalk language courses offering lessons for beginners. The Emirates app is a one-stop travel companion allowing passengers to book flights, hotels, car rentals, tours and attractions. In addition to the ice catalogue, passengers can browse through their flight’s menus and wine lists up to a month before the departure date. The Emirates app also features 3D seat maps which allows passengers to navigate the interior of the Emirates A380 and the Emirates Boeing 777 during seat selection, and explore the spacious cabin before they board.